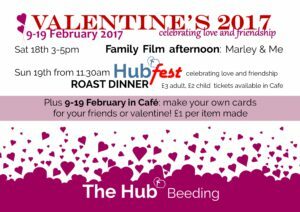 Lots going on at The Hub for the next ten days to help us celebrate the special people in our lives. Don’t miss this opportunity to tell a friend or family member how much they mean to you. Come and make them a card, bring them to watch a film or enjoy Sunday roast together. There really is something for everyone. Looking forward to seeing you!